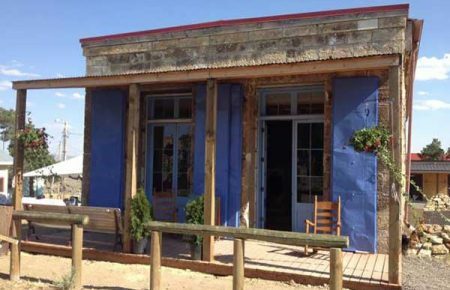 Tuscarora Nevada, once a bustling mining town, is now famous for producing art. Tuscarora is about 50 miles north of Elko via the Mountain City Highway (Nevada 225) and Nevada 226. There is no store. No cafe, no saloon, no commerce in the usual sense. There are only homes, studios, workshops, the post office and the Tuscarora Society Hall, which is staffed by volunteers on some summer weekends. 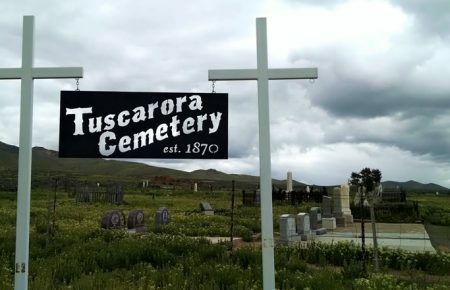 Tuscarora was established as a placer mining camp in July 1867, and named for the Union gunboat one of the miners had served aboard during the Civil War. In the spring of 1869 transcontinental railroad was completed and all the Chinese who had built it were cut loose. The 1870 census counted 105 Chinese and 15 whites in the district, most, if not all of them working long toms and riffle boxes in the Owyhee River and its tributaries. An 1871 gold and silver strike on the flank of Mt. Blitzen a couple of miles to the northeast, and Tuscarora boomed. As with so many such communities, the boom was relatively brief, and the population hasn’t been above 50 since the 1920s. Just now the population is back down to about a dozen who winter through, plus maybe 20 more who return every spring and depart every autumn. Tuscarora has produced one semi-famous (in his day) native son: William George “Wheezer” Dell was born in Tuscarora June 11 1886, the first Nevada native to play professional baseball in the big leagues. In 1912, age 25, he was a right-handed reliever for the St. Louis Cardinals. He pitched for Brooklyn from 1915 to mid-1917, including one inning in the 1916 World Series. Tuscarora’s great event takes place every other year, usually over the Memorial Day weekend: Open Studios, during which visitors may tour the ateliers and meet the “sensitives” who make the art.